A pay phone is located at the restrooms near the main parking lot. 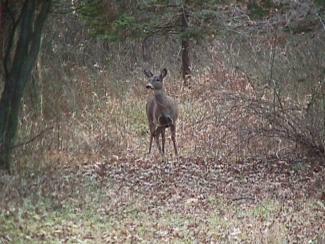 To contact a Ranger during evenings or weekends, please calls Hunterdon County Communication at (908) 788-1202. 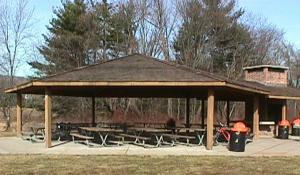 Picnic tables may be rearranged within the pavilions but must be returned to their original setting. Alcohol is permitted at Cedars Pavilion only. A special permit is required. While your permit entitles you to exclusive use of your reserved facility, please remember that Deer Path Park is open to the public, and facilities such as the pond, trails, restrooms, and open play areas are for the enjoyment of everyone. 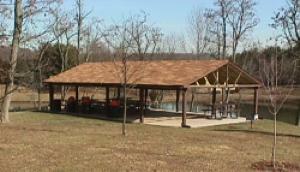 It is the policy of the Hunterdon County Parks & Recreation to provide reasonable accommodations for persons with disabilities upon advance notice of need. Water available seasonally from April 1 st through November 1st. Amenities: 13 Picnic tables, 2 Grills, Water, Electricity, and Horseshoe pits. Vehicles: Limited to 5 vehicles (2 handicapped): unauthorized vehicles will be towed. NOTE: Cedars Pavilion is located near the ball field and a play area. Amenities: 6 Picnic tables, 2 Grills, Electricity. Vehicles: This pavilion is located nearest to the main parking lot. Vehicles are not permitted in vicinity of pavilion. 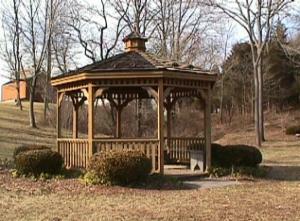 Vehicles: Vehicles are not permitted in the vicinity of the gazebo. Note: No Alcohol is permitted. The playing field may be reserved for single event use as well as league schedules. No vehicles or alcoholic beverages are permitted in this area. FROM CLINTON / I-78: Take route 31 south about 6.4 miles from Interstate 78. Turn left onto West Woodschurch Road, following signs for DEER PATH PARK and DEER PATH YMCA. Proceed about 0.7 miles on West Woodschurch Road (passing Deer Path Road on the right) to the joint entrance to DEER PATH PARK and the YMCA, on the right. Turn right into the entrance; a second immediate right is the entrance to the YMCA. The park entrance road continues straight, passing a supplementary parking lot on the left and ending at the main parking lot near the rest rooms. FROM FLEMINGTON (Circle - junction of Routes 31, 202 and 12): Take Route 31 north about 4 miles from the Flemington Circle. Turn right onto West Woodschurch Road, following signs for Deer Path Park and the YMCA. Proceed about .7 miles on West Woodschurch Road to the park entrance on the right.